BEFORE: When I saw The Avengers in May this year, I hadn’t seen all the previous Avenger films in preparation. I got around to watching Thor in July and now Captain America: The First Avenger leaves me with only one other film in the franchise to see (that would be The Incredible Hulk). Thor was able to provide a lot of background information on the plot in The Avengers; I wonder what value Captain America will add. AFTER: Marvel really has something great; they haven’t made a bad film yet. At least, not any I’ve seen. 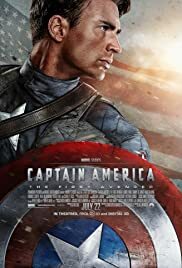 Captain America: The First Avenger takes place in the WWII era and follows Steve Rogers (Chris Evans) on his path to become the first of many Avengers, Captain America. That means, chronologically, this film comes first in the franchise. Overall, the story was well told. A lot of focused was placed on Rogers as opposed to Red Skull (Hugo Weaving) and his evil plot to take over the world. And it was more than just action; there was plenty of moral values explored in the film as well. One thing I could not wrap my head around was the level of technology. It’s only the 1940s and there are these gigantic, super-powerful weapons, aircraft, factories; the whole nine yards. I understand it’s fiction and they have people like the genius Howard Stark (Dominic Cooper) and mythical energy sources like the Tesseract. But everything besides the costumes looks like it came from the 21st century, not the 1940s. When it comes to suspension of disbelief, my bar is set pretty high; something really has to be out of place for me to bat an eye. I’m willing to believe most things in films as long as it is remotely possible. But the technology in Captain America was just too much especially since there was a lot of care put into the detail of other elements like costumes and set design to give the appearance of the WWII era. That being said, the action and the visual effects were fantastic, just reign back the machinery. Even a little goes a long way. Advanced technology aside, it’s a superhero movie; the point is to be left in awe by the striking visuals placed in front of your eyeballs. And by that measure, Captain America: The First Avenger passes with flying colors.